Meanwhile, in large bowl, beat cream cheese, hazelnut spread and brown sugar with electric mixer on medium speed until smooth. Carefully fold in whipped topping and graham cracker crumbs until blended. Reserve 1 tablespoon of the caramel syrup; set aside. Pour remaining caramel syrup into cooled pie crust; spread evenly. Spoon and spread cream cheese mixture over caramel layer. Freeze 1 hour or until firm. Remove from freezer 15 minutes before serving. Meanwhile, in small microwavable bowl, microwave chocolate on High 30 to 60 seconds, stirring every 10 seconds, until smooth. 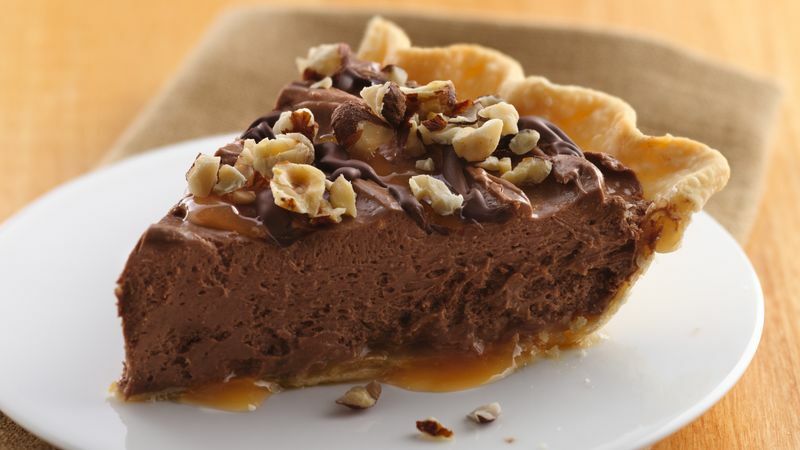 Drizzle melted chocolate and reserved caramel syrup over top of pie; sprinkle with hazelnuts. Store covered in refrigerator.